DETAILS Before you begin this project, I suggest you have a snowball fight with the bare Styrofoam balls. Click for link. Then, to calm the children down, you make the decorated snowballs. 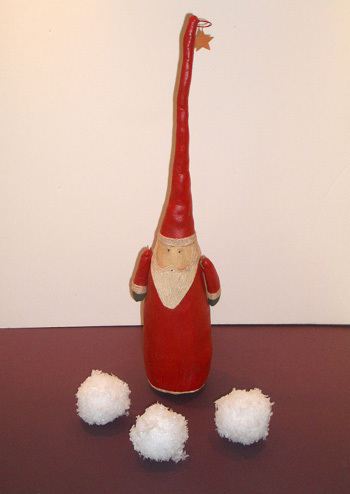 This is an easy, but messy project, gluing artificial snow onto Styrofoam balls. Initially I tried using craft glue from a squeeze bottle, but we had trouble getting the glue everywhere without getting sticky fingers in the process. Little fingers did not like this. So we moved on to the glue gun which has a lot of panache. Everyone wants to use the glue gun. One caution: beware of burned fingers, regardless how careful you are, it's going to happen. Keep a bowl of cold water at hand for dipping the offended digit. Doing this seems such a novelty, participants forget to cry. The snow, which you've purchased at your local craft store, should be piled onto a cookie sheet. Glue the ball, then roll it in the artificial snow. Heap it in great mounds over the foam ball. Once the ball is covered, take it in hand and squeeze, firming the adhesion. MATERIALS NEEDED Styrofoam balls, glue or glue gun. Fake snow, cookie sheet, bowl of cold water.